Q. How many people do you have on a course? 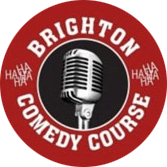 A. Brighton Comedy Course believes in delivering a course that encompasses personal and concentrated coaching so there is no more than 12 in a class. This allows each student to have the time necessary to perform and to have constructive, personalised feedback on every session. Q. What is the most important message of the course? A. You are doing an amazing thing. Enjoy it. Q. Have any of the students pulled out of the graduate show? A. So far there is a 100% success rate. Confidence techniques and regular class performance give students the foundations they need to go in front of a live audience and do their thing. Interviews of students after their very first gig can be found on the clips page. Q. Is the course beneficial off stage? A. There have been a number of professionals on the course ranging from a journalist to a builder to a yoga teacher. The feedback questionnaires often say that the course has improved their presentation skills and confidence greatly, helping them in their day to day business. Q. How often are the courses? A. There is an 8 week course every season, summer, winter, autumn and spring. There are also several weekend courses and an advanced comedy course as well as one to one coaching for corporate and customers with specific requirements. There is also wedding speech course which has helped people on their big day. There are more details on course page. Q. What mantra’s help to combat nerves? A. Whatever happens I will not kill anyone, no-one’s life is in my hands! Q. What is the best thing about being a Comedy coach? A. Seeing people who are shy come out of their shell is great though the most rewarding feeling is watching someone who’s never performed get up on a stage before a live audience and strut their stuff and love it. It’s an amazing feeling.